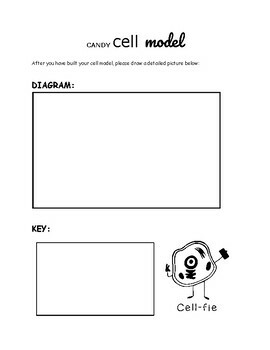 This product is a traditional candy cell lab with a fun twist! This lab is based off the popular Food Network show "The Kids Baking Championsip." Students will be given unknown ingredients, a 30 minutes time limit with music playing to create and build an edible cell model. Set the stage to engage- place edible items in a box or basket so students cannot view items before the timer begins. Wear a baking hat and apron to add suspense. This product is for a plant cell. 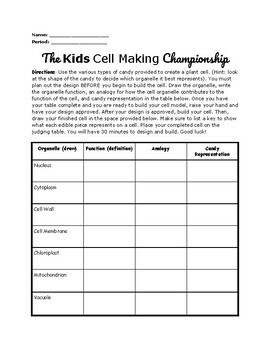 This product includes directions for the build, a table to write the plant cell's organelles, organelle functions, analogy, and candy representation. 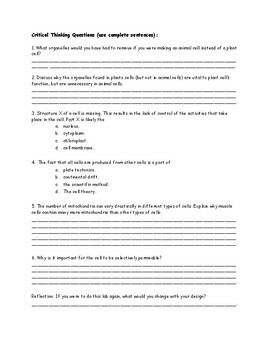 There is also a page for the student to draw a diagram of their cell model and write a key. 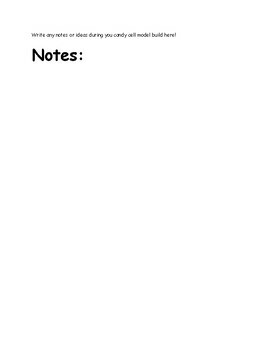 Critical thinking questions are also included.